We'd like to WELCOME you to JOIN US! Serving Up Hope 2019 will be held on January 26 at Riverside Golf Club in Grand Island. This year's signature ingredient, Pineapple, has significance for Hope Harbor. In 2019, we will celebrate 25 years of welcoming families who are looking for a shelter from the storm. The pineapple is known to be the symbol of hospitality. What a fitting way to begin our 25th year! We hope you join us! Burwell, Nebraska is savoring the delicious delights of its small-town Chef Tammy Pinckney. A self-declared “foodie” since birth, she has an AAS in Dietetic Technology and has been working in the food industry since she was 13 years old. Tammy is a wife, mother of 5 and grandmother of 8. She is co-owner of the Sandstone Grill and Catering with her sister, Tenise Jarecke. They have run this elegant, yet small town restaurant for the past 15 years. This rock star duo has helped locals and tourists learn to love eclectic foods not normally served on a Midwesterner’s plate. Sandstone was named Best Small-town restaurant of 2018 and also received the Nebraska Beef Maker Award. Chef Nathan has been in the restaurant industry since 1999, having first worked at the local Dreisbachs restaurant (now closed). He stays busy running two Irish pubs, one in Lincoln and the other in Grand Island. McKinney's Irish Pub offers the taste of the old country with a modern twist and a pub-like atmosphere the locals truly enjoy. Nathan graduated from SCC in Lincoln and is the proud father of two daughters, and husband to Shandie. McKinney's was named the main street business of the year in 2017 and they are a corporate sponsor for Big Brother and Big Sisters. Nate enjoys spending his off time playing golf, or softball and restoring a 1976 Corvette. This Alaska born lady migrated her way into Nebraska's hearts and tummy's 33 years ago. Chef Alice Osterman opened the Sweet Shoppe in St. Paul as a full-service bakery and cafe over 30 years ago. She is the proud mother of two and has 4 grandsons whom she dotes on as much as she can. Her collections of over 1,684 cookie jars line the walls of the shop for all to enjoy. Alice feels the best part of owning her business would be the friendships created over the years on a daily basis by every one of her customers who walks through the Sweet Shoppe doors. When Besim Shala touched the ground in the United States from Albania, he knew he would find the American dream. Cooking was not always Besim's first choice for a career. He also graduated from law school in Europe, but the cooking bug was in his blood. His grandmother taught him how to cook and before he knew it he owned two restaurants in Europe. When he decided to come to America it was with that passion to open his style of food and that started in Oklahoma, but Nebraska was where he and his brother would open the Napoli's Italian restaurants in Hastings and Grand Island. When he has time to relax he does enjoy watching or playing soccer. Besim and his wife, have 3 children who attend school in Grand Island. He is proud that his children value hard work and help him at the restaurant after school. A full shelter with a waiting list served as inspiration for a fundraiser to help Hope Harbor move forward with plans and programs that benefit the homeless. In 2012, Julie Gortemaker, then president of Hope Harbor’s Board of Directors, presented the fundraising committee with an idea for a cooking competition. It didn’t take long for the committee to rally ideas and put a plan in place. In February 2013, it all came together with the inaugural Serving Up Hope: Battle Caramel. Designed to be an annual event, the competition pairs local chefs with a staple ingredient to be crafted into a taste bud tickler. All the desserts were delectable, but Chef Sharena Anson’s Salted Caramel Dome Cake with a side of Iced Caramel Latte earned her the title, “Queen of Caramel.” However, the real winners of this event are those trying to better themselves – people who have fallen on hard times and deserve a second chance. 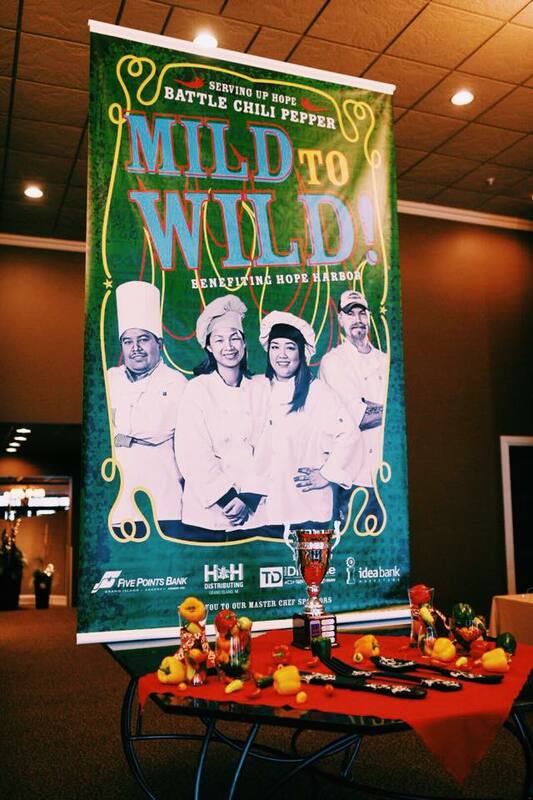 The dinner, auction, and dessert competition drew over 300 people in 2013, and more than 400 in 2014. We hope you’ll join us for this friendly competition and delicious event that benefits a great cause!